A deflected strike from Jermaine Jones and a cool Clint Dempsey finish put the US into the semi-finals of the Gold Cup. Bob Bradley left out Chris Wondolowski and Landon Donovan, bringing in Sacha Kljestan behind Jozy Altidore, and Alejandro Bedoya on the right. He was dealt an early blow with Altidore’s injury, meaning Juan Agudelo had to replace him upfront. Theodore Whitmore made various changes to his side having rested players for his final group game. Jamaica ended up in a relatively defensive-minded 3-4-3 shape. Bradley’s side dominated possession but took half an hour to start using the ball effectively, having been slow and unambitious with their passing early on. In the second half, they committed more players forward and forced the breakthrough. The teams played in front of each other in the opening minutes of the game – both sides got ten men behind in the ball in their own half when out of possession, and coupled with the slow passing on show from both midfields, goals looked unlikely. Jamaica’s problem was that they generally had 3 v 1 at the back, which then created a shortfall in midfield – where the US could gather bodies, pass around Jamaica’s midfield, and dominate possession of the ball. Bradley has long favoured playing his wide midfielders narrow – the US formation has often looked like 4-2-2-2 under his management – and this simply emphasised the US dominance in the middle of the pitch, sometimes creating as much as 4 v 2 or 5 v 2 in that zone (see below). The Jamaica wing-backs stayed on the flanks and retreated quickly into a five-man defence, which meant Jamaica had plenty of men in the box to defend crosses, but the workload for Jason Morrison and Rodolph Austin further forward was simply too great. However, there was some promising moments for Whitmore’s side early on. This mainly involved long diagonal passes from Austin out to the pacey Dane Richards on the right wing. With Dempsey playing advanced and narrow, and therefore offering little support to Eric Lichaj, Richards often had 1 v 1 situations against the Aston Villa full-back, and created a couple of decent chances early on – Luton Sheldon played narrower on the opposite flank, often becoming a second striker. Jamaica were only likely to prosper through quick breaks down that side. As a whole, their side was ‘broken’ – seven defending, three attacking. There was little support from the wing-backs, and neither of the central midfielders were willing to vacate a zone Jamaica were already overloaded in. Kljestan drifted around to the channels when the US had the ball, but was disciplined in moving onto one of Jamaica’s central midfielders when out of possession. As the game went on, Richards was less of an attacking threat, but his battle against Lichaj was the key contest. Richards appeared completely unwilling to track back at some points, which meant that when Dempsey moved inside and brought Eric Vernan slightly narrow, Lichaj had space to motor into on the overlap – although service didn’t always arrive. The opening goal was fortunate – Jones’ strike took a huge nick off a defender on the way in – but the goal reflected the balance of play, and also the key tactical shift as the game went on. Jones started off playing deep in a double pivot alongside Michael Bradley, but once the US had worked out that they didn’t really need two holders as Jamaica had no attacking threat from the centre of midfield, Jones pushed on and drove the US forward. In addition to the goal, he also made the powerful forward run which forced Jermaine Taylor into a ‘last man’ foul, and a resulting red card. That was a shame, because a couple of minutes before Jamaica went down to ten men, they had brought Jevaughn Watson on for Vernan, and seemed to briefly go to something more like 4-4-2, with Shelton coming to the left, Williams going further forward, Adrian Reid going to right-back and Demar Phillips to left-back. There wasn’t enough time to judge the new system before the red card, however. Jamaica just about coped with ten men – a vague 4-3-2 system that overworked their already-tired midfield held up reasonably well – but constant substitutions played havoc with the organisation at the back, and the US were able to work 3 v 3 situations quickly once Donovan came on to provide another attacking threat. The US were able to break through the Jamaica defence increasingly easily – Whitmore ordered them to push up but with no pressure on the ball, it was a tactic unlikely to bring rewards, and Dempsey’s neat finish wrapped up the game. The problems of having 3 v 1 at the back have been discussed many times on ZM before, but this was an interesting game because the US wide players played narrow, as ‘interiores’, in Spanish terms (see Villarreal). This gave the Jamaica wing-backs considerable difficulties, and created a huge overload in the centre of midfield. The difference in technical quality meant that Bradley’s side were always likely to eventually create goalscoring chances, and Jamaica’s transitions from defence to attack weren’t good enough to provide a consistent attacking threat on the break. Good work on the analysis. Can we expect to see one on Mexico? Yeah, will do the semis and the final! Best game from the US so far in this tournament. Really hoping Bradley moves away from out stale 4-2-2-2. Also, Aguedelo’s movement and penchant for dropping deep really helps our side’s fluidity, and is a pretty natural fit for runs from the midfield from Donovan and Dempsey. 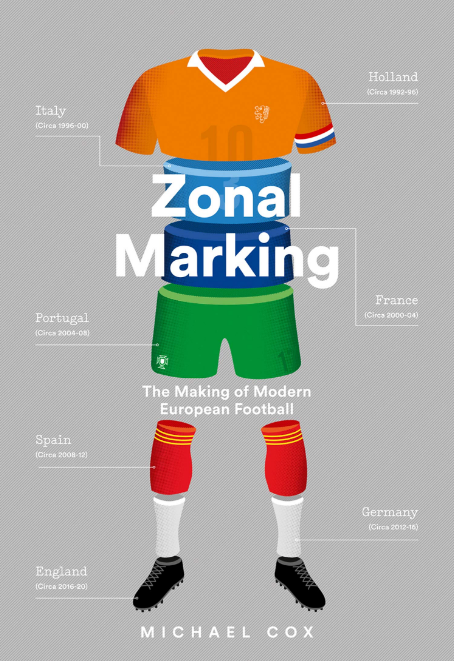 Hi Zonalmarking. Really love your articles as they are very insightful and interesting. Will you be doing an analysis on the Copa America as well? Not that I’m complaining in this situation, but doesn’t the 3-4-3 work much better when you apply pressure ….. starting with the front 3? Algeria used the same shape in the world cup against us, but with more pressure. Gave us some problems early on, especially as they had several scoring chances (considering our poor starts to games). New Zealand used a 3-4-3 against Italy. Sitting deep as well, but they left their front 3 higher up the pitch… forcing Italy’s backs to stay back. Napoli’s shape this season was technically a 3-4-2-1, but very similar to a 3-4-3, and it worked very well against all the 4-4-2’s in Seria A. And finally, every neutral’s favorite Chile. Technically a 3-3-1-3, but again very similar to a 3-4-3 (but simply having a designated holding mid and attacking mid). To sum it up, all of these team’s punching above their weight using this system WITH pressure. Jamaica’s farthest player forward was dropping behind Bradley and Jones, and outside wingers inviting USA’s outside backs forward. 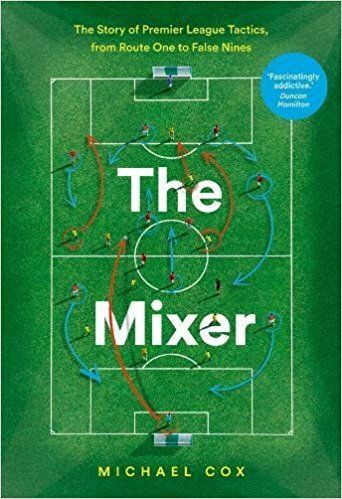 … and personally, I felt Mexico was doing pretty well against Argentina in the World Cup using their 3-4-3 system until Tevez’s offsides-no call goal… then everything fell apart as they had to chase the game. A 3-4-2-1 might have worked better for Jamaica. If they had played everyone narrow except the wingbacks when out of possession they could have occupied the two holders, and pushed their wingbacks up to challenge the US fullbacks. This might have forced the US to change their attacking shape, dropping the fullbacks further back to give the CB’s an outlet and find some time and space. As it was, Jamaica played more of a 5-4-1. Although the 3-4-2-1 with a narrow trident almost certainly would have been the right shape against the typical US 4-2-2-2. The best answer would have been a 4-1-4-1, with a holder who is an auxillary center back, like Marquez for Mexico last summer (haven’t seen them play yet this tournament, not sure if they are continuing that tactic). We don’t get the Gold Cup matches broadcast here, but the description of Jamaica reminded me of NZ at the World Cup too. NZ did press with the front three, who were all natural strikers, but the three 4-4-2s we came up against didn’t try and take advantage of the lack of numbers in the centre either. We had two defensive minded players in their mid to late 30s in the midfield, I’d imagine if Italy had applied a similar strategy to the USA then they could have got similar results to the USA. As it was, by the time they did apply pressure on the centre we were happy to sit back and dig in. JM, I don’t know if there are regional blackouts, but Univision has been streaming the games online in Spanish. The semi’s are Wednesday at 6 and 9 PM central US time. the main difference is the us only played one striker in this game compared to against algeria. Jamaica would have had to switch a centerbck for a central midfielder like how bielsa dealt with lone strikers for chile if he wanted to continue his high press advantage. No point pressing high up the field when the other side outnumber you in midfield. It just leads to your pressing forwards getting passed up because a central midfielder will always be in space. I think this is exactly right. I’m really hoping this was Bob Bradley recognizing that Jamaica’s preference for 3 in the back gave him an opportunity to decisively win the midfield battle through a tactical shift, rather than this being a case of him changing something almost at random. Whatever the impetus, though, it was clearly the right choice, and Jamaica never fully dealt with the situation. Just wondering but what made you give Lichaj an arrow and not Cherundolo? If anything Cherundolo plays in more of a wingback position all the time so I thought he’d technically be the one to get an arrow. It’s obviously not a big deal just wondering. I also thought that Dempsey played the more central role with Bedoya and Kljestan to either side. I don’t know how you saw it the other way (I know all three rotated) but Dempsey was supposedly playing a second striker role like he does with Fulham. 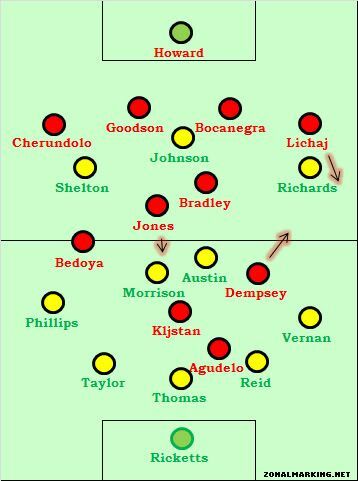 Also, when the US had possession they seemed to be playing in a 3-6-1 (3-3-3-1) with Jones or Bradley playing between Goodson and Bocanegra and with Lichaj and Cheroundolo joining the other holding MF. Dempsey Bedoya and Kljestan rotated, and Dempsey looks to move central but tended to start from the left when out of possession – listening to American announcers is almost as misleading as listening to English ones. Concerning the 3-6-1 comment, when in possession the US split their center backs wide, push the fullbacks high up the pitch, and both the holders take it in turns to drop back towards or between the CB’s, pick up the ball, and lay it off again until an opening appears. They do this regardless of formation, and were doing it last summer in the World Cup. But so do most teams. Kljestan started the match in the CAM position. Seemed very consistent to me, Dempsey pretty much stayed on the left. They may have started swapping positions more once Donovan came on the pitch, as well as the red card being issued. Both Dempsey and Donovan ended up centrally-located around the time of the 2nd goal. Most teams running 4 back will have their fullbacks level with the holding midfield layer when in possession from the back. Probably Bob Bradley’s best game in his 5 years as manager of the US. I didn’t think he had it in him to actually switch formation based on the opponent. It definatety caught Jamaica off gaurd that the US didn’t play with the usual 2 up top, the Jamaican players looked lost. This is the formation we should be playing on a regular basis with a few personel changes. Klejstan played pretty good today but I think he’ll be less affecitve against stronger competition. Dempsey or maybe even Adu should play in that central role. Having Dempsey on the left and then playing a right footed player at left fullback doesn’t give us a whole lot of width down that side. Lichaj gets forward well and unfortunately he is probably the best option at left back. So if he is going to continue play there a more natural wide player than Dempsey should play in fron of him. Also, I think it was fortunate for the US that Jozy got hurt. Like Brian said above, Aguedelo’s runs into the channels and his movement in general is a much better fit for the team if Bob is going to continue with this formation. Good stuff ZM. Looking forward to the analysis for the semis and hopefully a US-Mexico final. Please, not Adu. I agree with the rest. Lichaj is playing well, but his right footedness makes him predictable from that spot. And Jozy only contributes when he is scoring, which isn’t often enough. It’ll never happen, but I think it would be interesting to see Donovan at left back. holden was intended to play in klejstan’s role before the injury so no worries about adu (although i wish he would atleast be given a chance as a sub because his technical quality can unlock these teams that sit deep if we need it rather than pacey forwards that can do nothing against such teams) The biggest thing that convinced Bradley to change shape was holden’s form in the first half of the season. Expect to see us in a 4-2-3-1 in big games with jones and bradley sitting deep and donovan, holden, and dempsey behind altidore. Yeah, can’t wait for Holden to get healthy. In addition to a 4-2-3-1, I’d like to see the US try playing him deep, between Jones and Bradley, like a Pirlo who likes to tackle. Did we ever try Holden there? I don’t remember Bob ever using 4-2-3-1 with Holden in the central role. Not saying that it couldn’t work, I just don’t know what makes you so sure that this was/is Bob’s intentions. Well, we’ve never tried him there, but that’s because we’ve never played a team with Dempsey, Donovan, and Holden after Holden established himself at Bolton. Considering that Donovan and Dempsey are the first choice wingers, and we have so much depth in defensive midfield (Bradley / Jones / Edu), it’s the logical choice to play him in the #10 role. I should add Kljestan to that list – he plays as more of a deep-lying midfielder for Anderlecht (albeit largely because Biglia was injured for much of the Jupiler League playoffs). I don’t think we should underestimate what a difference Lichaj made in the fluidity of the attack. He pressed high up the pitch, and has enough pace and skill on the ball to keep a defense honest. This gives more room to Dempsey – our most dangerous player this tournament – to operate. ZM, thanks as always – looking forward to more US recaps. Three things…first great work as usual, secondly if we get a US Mexico final will there be a preview before the game or just the postgame breakdown, and lastly will there be some sort of preview for the teams at Copa America especially Chile since Im curious to see how they will look now under Borghi. As a USA fan, i’m slightly encouraged by this result, following the poor performances against Spain, Panama, and Guadeloupe. However, I still doubt that our center backs can hold up against determined opposition pressure and sustained possession (which will come, if not from Panama, then certainly Mexico in the final). Decent performance from the midfield though, and Jermaine Jones caused a lot of problems by driving forward from his holding role. Jones punctuated his performance with a world class dive to win the red card and seal the game (I’m a little ashamed about that one though). My fear isn’t that we’ll give the ball away too cheaply. The real danger is that our center backs are positionally woeful, and a side that can thread through balls behind the defense will run riot against us. See USA 0-4 Spain. Granted, Silva and Alonso are better than Guardado and Torrado, but its still a concern. Thought Kljestan had an interesting game for the U.S. I would just like to point out that that wasn’t a foul on Jones. It was a blatant dive. go google a slo-mo replay, you can see that Jones was clipped by the Jamaican player. I also initially though it was a dive until viewing the replay. Also, the fact of contact is evident by the Jamaican players resignation after seeing the card. he didnt even try to argue because he knew he did it. p.s. props to ZM for covering the US! was a great read and looking forward to more. Nice work, ZM. Thanks for covering the US. Bob Bradley should get lots of credit for this one. He seems to come up with big games following big disappointments. He tried to bring in a new CB pairing of Goodson and Ream that would provide some technical ability in opposition to the destroyer-only skills of Onweyu and Demerit. It has been shaky, but at least BB has the guts to risk his neck for the good of the USMNT future by attempting to develop a possession based philosophy. I couldn’t agree more. “Destroyer” has double meaning for players like Onweyu and Demerit who win the ball tenaciously only to kick it out or too far up the pitch and thus destroy the flow and possesion of the match. Using more technically skillful players who are inexperienced is risky against experienced opposition yet how else are these rookies to learn? I’m excited for the future! hey ZM, i know it is off topic but what do you think of villas-boas going to chelsea? Do you think chelsea will start playing a more possesion based game? Great piece, awesome to see some Gold Cup coverage from a premier football site. I’m looking forward to final and semi final coverage! This game was a warning – the 3-4-3 too easily turns into a 5-2-3 with two blurry lines and no transition/counterattacking game. Dane Richards really struggled to get involved because his team’s shape left no outlet for width and way too much space between the defense and attack. I liked what I saw out of Aguedelo. He doesn’t start for the NY Red Bulls, but then again he’s behind Thierry Henry and Luke Rodgers (a different kind of forward). * Bob Bradley has been experimenting with variations of 4-5-1 to get as many central midfielders on the field. The main problem is that the attack usually stalls. * Best game out of Jermaine Jones in a USA shirt so far. Possibly due to better understanding with other players, or due just the numerical mismatches in the middle. * At this Gold Cup, Jamaica has the most players currently playing in Major League Soccer. The USA coaching staff and players should have a high familiarity with the Jamaican players. I’d like to echo those above with a hearty thank you to ZM for covering this game and also for the planned coverage of the Gold Cup semis and finals. Hopefully Coach Sweats continues to get his tactics right as the tournament progresses. what software do you use to draw the formation diagram?? Plzz, allow us to experiment with this..
What’s your opinion of Sacha Kljestan, based on the game? Agreed, great to see some of your analysis of the USMNT. Can’t wait for Wednesday night. Agudelo fits this new formation better than Altidore. Nevertheless, it’s good to finally have some attacking options. Great work, as always. Just wondering, what site/software do you use for the chalkboards?